Glenn Bydume knows a thing or two about hard work. After all, he was a full-time firefighter for 28 years. He was the Fairfax (Virginia) County Battalion Fire Chief for a large part of that tenure. So when he became a Fed-Ex Ground contractor, he put his heart and soul into his new business venture. 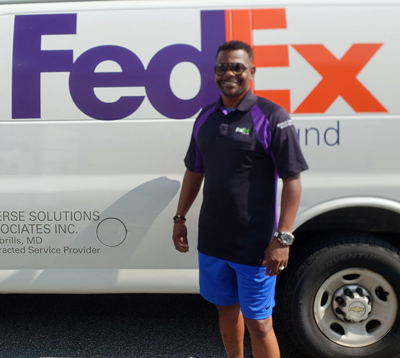 Glenn, who is the CEO of Diverse Solutions Associates Inc. in Baltimore (Maryland), has financed 33 different delivery trucks with Stearns Bank since he started his business in 2013. Glenn’s partner, Reggie Lassiter, the CEO of Supreme Logistics in Bowie (Maryland) referred Glenn to Stearns Bank. “We transitioned a few leases to Stearns Bank because it was so easy and seamless working with them,” Glenn said. Glenn has enjoyed working with Stearns Bank client relations representative Terilynn Palmer on his company’s financing needs over the years. Whenever he has needed something, Terilynn has responded right away to his company’s needs. “I had a few issues once and Terilynn was patient and ended up getting me financing on five different trucks. She’s always on top of things. When I started Diverse Solutions, I needed nine trucks right off the bat. I was able to get them right away thanks to TeriLynn and Stearns Bank. She has always met any requests I’ve had,” Glenn said. And, the fact that Terilynn returns his emails and calls in a timely matter is something that definitely stands out to him. “The customer service and follow up is great. In the business world, you have some people who never call you back. She will text, shoot me an email – she always follows up. She does everything except cook me a meal every time I call,” Glenn said with a laugh.